The Tiger's Watch by Julie Ember. Harmony Ink Press, 2017. Ebook. 180 pages. I had fairly high expectations for this book based on the sheer amount of hype it seemed to be getting prior to its release. To be fair, much of the hype I was seeing was moreso surrounding the fact that this book contains a nonbinary character -- Tashi -- and a great deal of other forms of representation. The Tiger's Watch is actually one of the first (of hopefully many more) books I've read with a gender-fluid protagonist, and I really loved it. This review is difficult to write because I know that I really enjoyed this book, but when I try to answer 'why' I enjoyed it so much, I'm not sure how to describe it. It comes down to this: I didn't want to put this book down. It didn't feel like there was a lot of plot going on, but I still couldn't help but keep reading. The characters, the story, the setting, the world -- all of it was fascinating. There was something captivating about Ember's writing that really drew me into the story and the small world that encompassed it. Tashi was an incredibly interesting character. They were pretty shy and seemingly innocent, but at the same time they were also pretty tough. In a weird way, I especially liked that they made pretty really bad decisions (some of which annoyed me more than others. Also, I was so pleasantly surprised to see how easily this world seemed to accept non-binary people. There were than a few instances where someone would tell them that Tashi preferred to be referred as "they," rather than "s/he," and for the most part people just said okay, move on with their lives, and respect that choice. What? A fantasy world that doesn't keep all of our prejudices? I know, I'm also in a state of shock. I've always been a fan of the fantasy trope of people bonding with certain animals, and I especially loved the way it worked in this book. For instance, the animals chose who they bond with at a certain age, and then the human -- known as an 'inhabitor' -- only lives as long as the animal lives and vice versa. 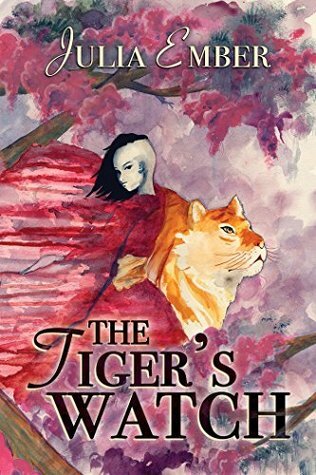 There were something very authentic about how this relationship worked, as Tashi also made several mentions throughout the book regarding how her tiger was still wild and she couldn't necessarily communicate normally or speak to her animal. I had mixed feelings about the benefits and drawbacks of bonding with animals thought was brought up, along with some other more spoiler-y things that I won't get into. The bonding with animals is mentioned by Tashi as being something that she wishes that they could give up so that they -- and other inhibitors -- could live longer. I completely understand that, but I don't understand either: 1) why bonding is so important, or 2) why you would want to give up something is ancient and magical and apparently really great. I just felt like this idea wasn't quite explored as in-depth as it could have been. I was also impressed with how Ember explored different forms of relationships. She did a great job of noting and using the difference between relationships based on deep, emotional feelings and attachments versus relationships centered sexual desire and attraction, something that I wish more authors considered. The only thing that I felt sort of let down on was the lack of history and context in this book. I know that there is a huge conflict going on and Ember does explain this to a point, but I just felt like was more that was missing. I can see future books going into the world and background more, but I just felt a little left out of the loop regarding what was really going on. Overall, I found this book really engaging and easy to follow along. I was invested in every character and found myself very much engaged in the story. Thus, I'm giving The Tiger's Watch four stars!